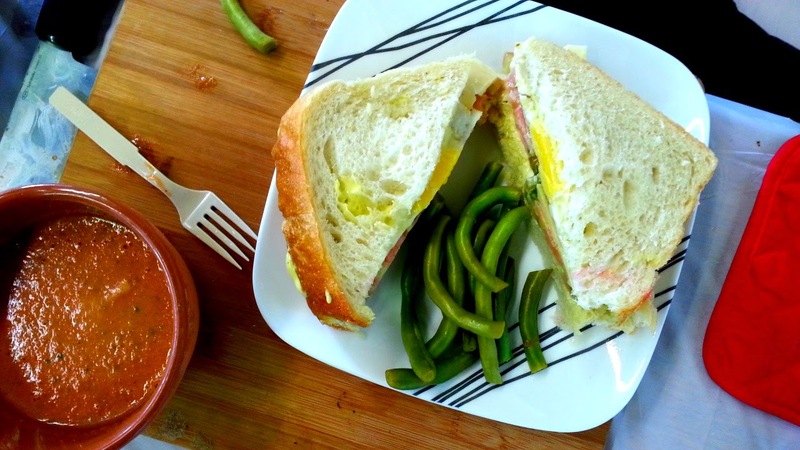 This week I made pickled green beans, tomato gazpacho and tomato & fried egg sandwiches with homemade mayonnaise aioli--because you can't have a tomato sandwich without mayonnaise. I'm probably going to get lambasted for this, but I cannot stand Duke's mayonnaise. It's too sweet and the wrong kind of tangy, to me. I'm a Hellmann's fan through and through. They don't don't call the company Best Foods for no reason! It's easy to see how simple it is to make your own, but tomato sandwiches aren't complete without mayonnaise of any kind. This week I also visited Camino Bakery at Dixie Classic Fair Farmer's Market and as you can see in the video, I act like I've never heard of or seen the place before. Total FACEPALM. In reality, I am at Camino Bakery a few times a week. I'm there so often, when I'm not, people get worried. I go for the Krankies coffee and I stay for the free wi-fi. Pickled anything is good to snack on. 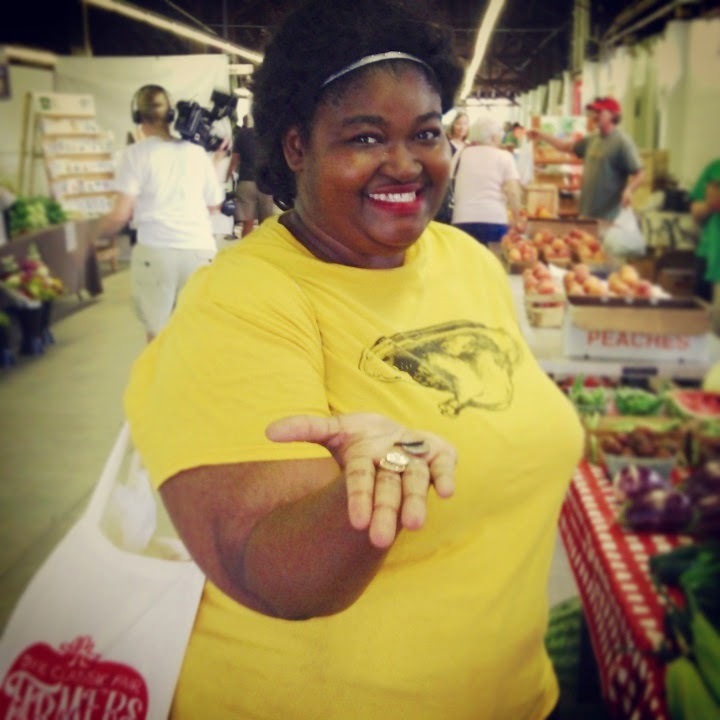 Be it green beans, okra, jalapenos, onions or kippered snacks, they go great with sandwiches, beverages, or on their own. The brine solution I use to make these beans is sweet, yet spicy with onion-y undertones. Recipes are merely guidelines and you can use fresh or dried herbs and different seasonings to achieve a tasty result. Try fresh or dried dill, sage, marjoram, and juniper berries for a different flavor. I've been asked about the unusual lid I used to close my Mason jar. It's manufactured by ReCap Mason Jars. The idea debuted to a successful Kickstarter campaign and the caps are spill-proof and BPA-free, can turn your jar into a drinking glass, storage container or something else completely different. ReCaps are available for Widemouth and Regular-mouth Mason Jars, too. Go to http://masonjars.com for more info and buy your own set! Sanitize one 1 quart jar with a ring and lid. 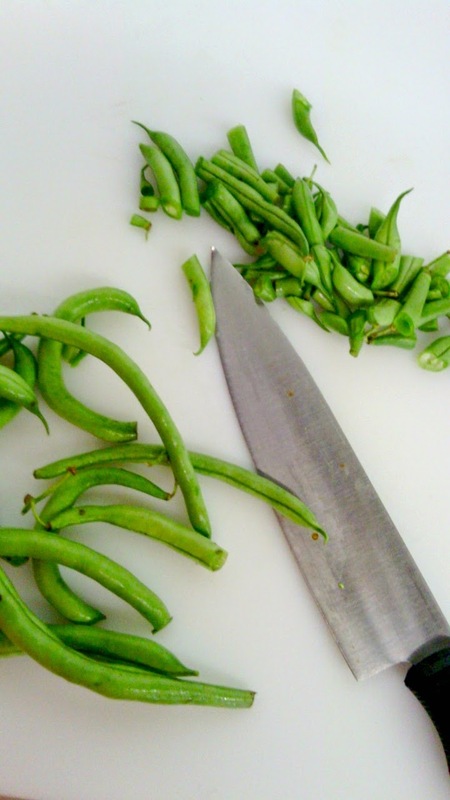 Slice or snip 1/8 inch off each end of each green bean. 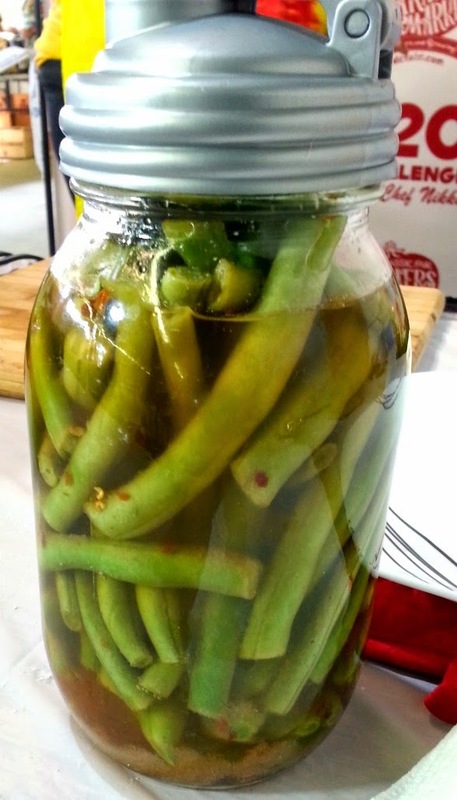 Pack green beans into the jar so they are standing on their ends. In a large saucepan, bring the water to a boil and stir in the vinegar, salt, sugar, onion powder, peppercorns, bay leaves, and red pepper flakes. Bring the mixture back to a simmer and let the sugar and salt dissolve. Once that happens, take the saucepan off the heat. Ladle or pour the boiling brine into the jar, filling to within 1/4 inch of the top. Seal jar with lid and ring. Let the jar come to room temperature before opening and enjoying your fresh, pickled beans. Alternatively, place your jar in the refrigerator after the jar is room temperature and enjoy the beans for up to 6 months. This gazpacho has become one of my signature dishes, I think. I make it multiple times each summer to rave reviews from everyone who has had the opportunity to sample it. I've been asked if it can be heated to make a hot soup. Of course it can! I don't recommend it though: the subtle fresh flavors of the tomatoes and cucumber will probably be ruined by the heat and the slight caramellization of everything will just make it a wet, soupy mess. But that's just my opinion. Remember: recipes are merely guidelines. Combine the first 5 ingredients in a blender or food processor until blended and thoroughly mixed. Sprinkle in granulated sugar, season with salt and pepper and with the processor running, slowly pour in the extra-virgin olive oil. In a blender or food processor, add egg, vinegar, salt and pepper. Blend to combine and with the processor running, slowly add olive oil. Add, a few drops at a time, to the egg mixture, until all oil is incorporated and mixture is emulsified (If mixture separates, stop adding oil until mixture comes together, then resume adding oil). The mixture will lighten in color, thicken and reach a pudding consistency when complete. If the sauce is too salty or vinegary, add more oil.